After months of leaks, Ubisoft is finally teasing the official reveal for the next Assassin's Creed game. It feels a bit anticlimactic to see such vague teasers when many of the game's most important details have already surfaced but let's be nice and play along. I wonder if that's the final logo or if it's just a teaser as well? Every main Assassin's Creed game since AC3 has made little thematic tweaks to the design: stars, a pirate skull, glitchy lines, industrial-looking plates. 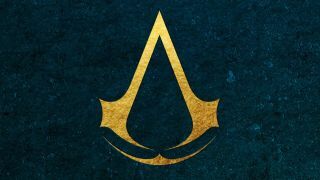 Leaks indicate that the next Assassin's Creed will go all the way back to ancient Egypt to explore the origin of the Assassins as sort of a soft reboot for the series, and this "back to basics" Assassin logo fits that idea. Plus, gold never goes out of style. Ubisoft hasn't said when to expect the official reveal but you bet your sweet hidden blades that we'll cover it when it does. Until then, see if you agree with our ranked list of the best Assassin's Creed games.